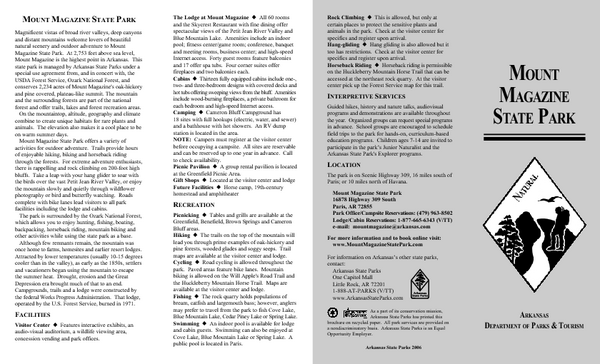 Map of Mount Magazine State Park showing hiking trails and amenities. Cane Creek State Park Detail Map showing amenities, camp sites, and lake. Map of Lake Dardanelle State Park showing park sites, trails and amenities. Trail Map of Mount Nebo State Park showing hiking trails and park amenities. Map of Lake Fort Smith State Park showing visitor center and park amenities.